The music and story of Peter and The Wolf by Prokofiev is a classic with instantly recognisable notes that are heavenly to the ears. This production by Coisceim Dance Theatre at Birmingham's DanceXchange keeps that delightful music - performed live on stage by a pianist - but adds so much more. The Wolf and Peter is a refreshing all dance reimagining of the tale, very much from the perspective of the various animals. There's a duck, a cat, a bird and of course a pack of wolves. It's funny, sentimental and heartfelt, making it an enchanting show not just for children but for adults too. 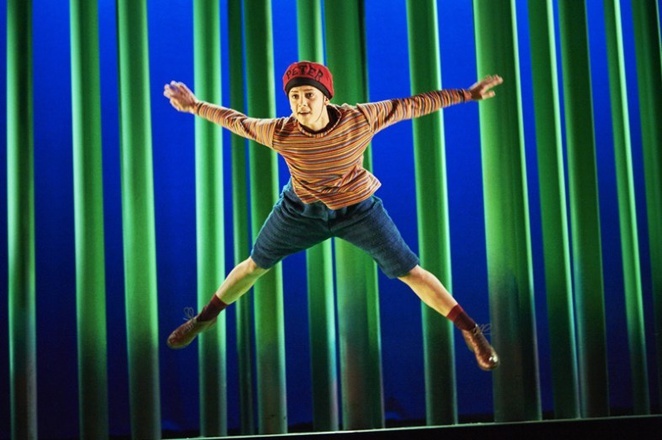 I caught the show at DanceXchange's base at the Patrick Centre in Birmingham Hippodrome during its UK tour. It is choreographed beautifully with a small but talented cast who play numerous roles. Created by David Bolger, the choreographer said he chose this piece of music because it "seems to cry out to be danced to". He's taken the spirit of the music and added an extra dimension to the story of a young boy who goes exploring beyond a locked gate, into the woods where he encounters his wild neighbours. In this version, Bolger is seeing things very much through the eyes of the wolf. A wolf who break dances his way around stage and eventually becomes a cool childhood friend to Peter. There's real thought been put into the characters, so much so that when the dancers skulk away their silhouettes appear to be just like a real pack of wolves with scrawny legs and pricked up ears. Playing the lead wolf is Mateusz Szczerek, who has immense charisma on stage along with impressive talent. He began training in break dance and ballroom 10 years ago before founding the group SLC, which was awarded first place at the Hip Hop International 2015. The wolves aren't the only characters to come alive through the dance and movement, there's also a lovable duck, in bright yellow flippers and water wings on his arms, who is a quirky creation. Then there is the unflappable bird, wearing a pork pie hat with a feather, whose chest is proudly stuck out but comes unstuck when faced with the cunning, mischievous cat. The cat is one of the highlights as dancer Emma O'Kane delivers the feline characteristics to a tee and is literally the cat that gets the cream in this production. There's a lovely scene where this moggy demands her dinner, which is laid out for her by Peter and his grandfather in a similar way to a diner at a French bistro. It is exactly the nature of a cat. 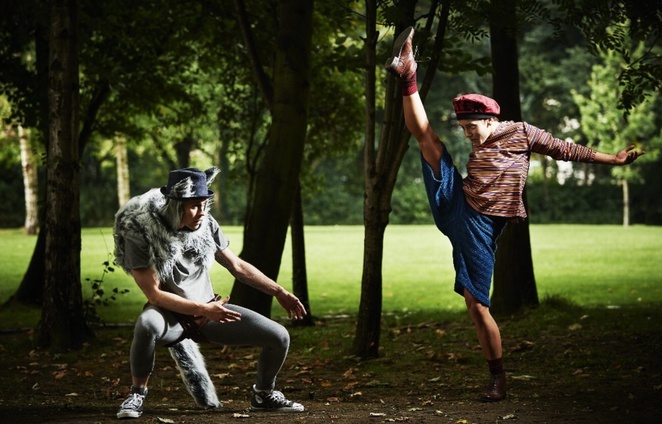 Despite all the humour and playfulness, the most endearing and heartwarming scenes come when the wolf and Peter dance together. Peter is played energetically by youthful looking female lead Ivonne Kalter, who bounds around stage like an eager young boy. It's when the wolf has been put in a cage that Peter starts to put himself in the wolf's shoes and a new friendship begins. Their dance as they break free through the woods is carefree and charming and brings to a close a whirlwind of an adventure that has lasted just 55 minutes. 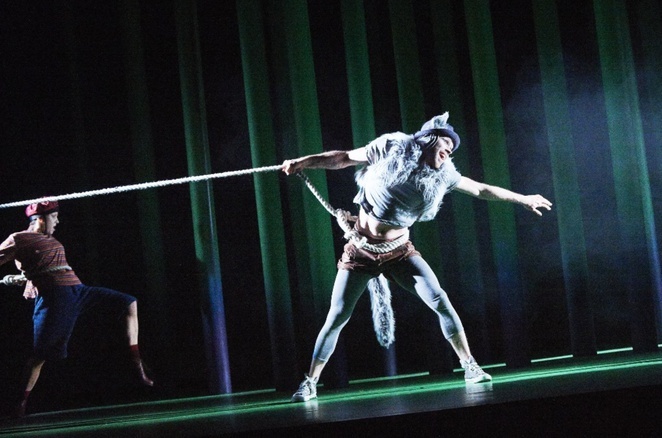 The Wolf and Peter is an irresistible, innovative and enchanting dance production with the coolest wolf you are likely to ever see. The tour is at DanceXchange, Birmingham, from December 2 - 3 and then continues to Dance City, Newcastle, from December 7 - 10; followed by Mermaid Arts Centre, Bray from December 14 - 16. A tour in Ireland also takes place in 2017.